I guess the definition of "affordable" depends a lot on your income. Thanks, Jennifer. You CAN totally afford it, since there aren't actually any houses there to buy. actually, in this case the quotes are pretty accurate. just not sure the author realized it. Indeed, that's about three times the cost of new houses around here! Holy cow, where was this picture taken? Low $600s? Affordable? Yeeesh. As there appears to be neither a house built nor anything required for a functional subdivision (e.g. roads, power lines), those implicit three zeros may no longer apply. 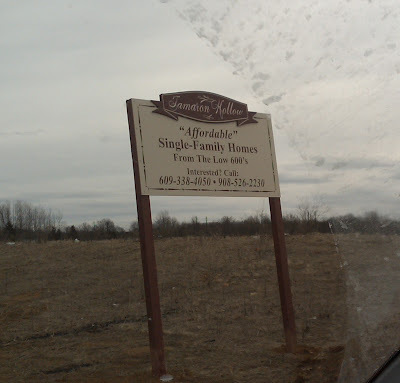 $610.00 for a plot in an undeveloped subdivision? I have no clue if that's a good investment or not. I don't think it's 'affordable' to supply your own infrastructure. Love how 600 is possessive- it's 600s, not 600's.